Today at TAWS I felt like making a rainbow… so I did! I decided to use my pencils to add details to my card and who doesn’t love a bright and multicoloured lollipop, this one is so cute (it would even look great in some Christmas colours). You can find the stamps linked below or head over to The Alley Way Stamps to see what else is new! Other Supplies: The Alley Way Stamps – Party Pooper. Prismacolor Pencils – Pink, French Grey 50%, Warm Grey 70% . Faber-Castell Polychromos Pencils – Cream, Cadmium Yellow, Cobalt Green, Burnt Ochre, Burnt Sienna, Walnut Brown. < Previous Video : Watercolouring with Crisp Inks! Next > Video : Hello Glitter! Wonderful card…love the colors and really love the bear. Such a CUTE card, Therese! 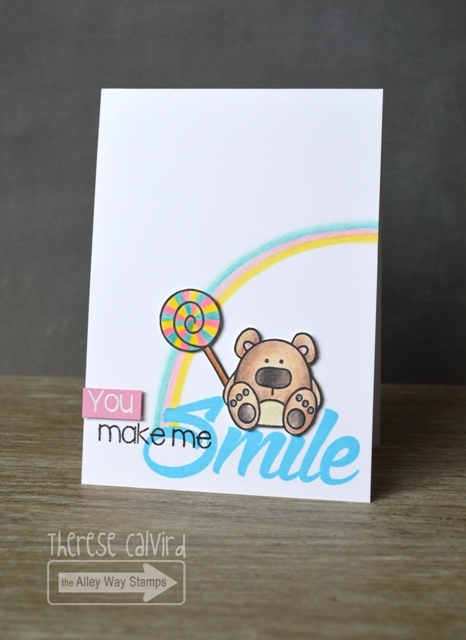 I love the lollipop and the rainbow is such a fun idea! Love the font on the ‘Smile’ sentiment, too! Thanks so much for the video! Nice happy card for this grey Monday morning 🙂 He is very cute. That is so cute. Love the rainbow and all-day sucker colors. So sweet. Loved seeing the bear being coloured and I much prefer being able to stay on your blog to see the videos – awesome! Great card, love the rainbow and lollie pop. So adorable and beautifully done! Such a happy card to make one smile! Love the rainbow which seems to twirl into the lollipop – great detail! 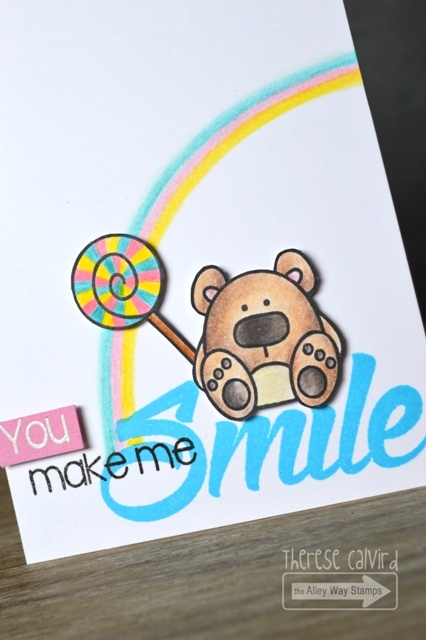 What could be sweeter than a bear and his lolli sitting on a smile under a rainbow! This is so fun and I love that you drew that rainbow.